My son, 9, doesn’t like compliments. He says, “yeah, yeah, whatever,” and yet he still needs to know I do notice them. Lately, his attitude and actions have left my husband and I throwing up our arms in desperation wondering what to try next to get through to this growing strong-willed blessing. Here is one thing I am trying: positive reinforcement! I bought a little 4×6 frame at the thrift store and painted it aqua blue to match our coastal cottage bathroom. 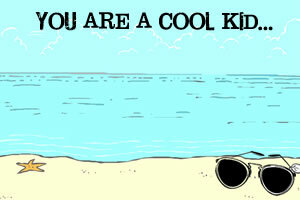 Then I found a clipart-style beach background and some sunglasses clipart that I added to the right bottom corner. 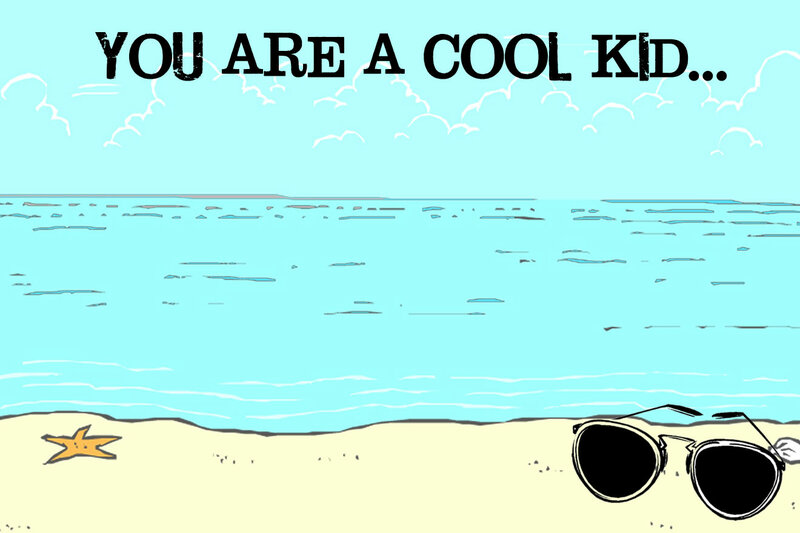 I put the words, “YOU ARE A COOL KID” on it in a fun font at the top and printed it out and framed it with the glass. Did know dry erase markers write easily on glass and wipe off with a tissue? How did I not know that? you can buy them at Walmart, an office supply store, etc for a few dollars. So each night after my son goes to bed I think of something he did that day that was awesome. Was he extra patient with a friend who needed it? Did he help me with a task that was difficult for me? Did he show good character in a choice he made? Some days I can think of a few great things he did but I need to just narrow it down to one, remembering boys need fewer words! The irony is I did this for him but it is helping me! Because, when he fights his way from the tub to the bed to go to sleep and I am utterly wiped out physically and emotionally, it forces me to think of all the great things he did do that day. . . And how much I love him. And that he is a good kid, with a good heart, he is just asserting his independence in a lot of ways! I originally saw this idea on Pinterest.com but the frames said, “I LOVE YOU BECAUSE…” I love my son unconditionally and to say “I love you because… You took out the garbage” or “you helped me bring in the groceries” seems a bit silly. I love him, not for what he does, but because he is my son. So. . . Think of the possibilities! 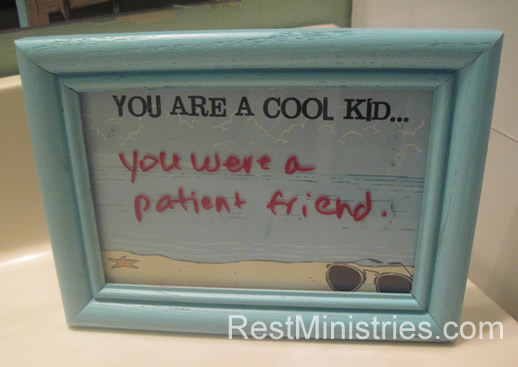 Get your own little frame and write a new scripture on it each week. Write a note from God –to you–on it, to sit on your nightstand and see first thing when you wake up. 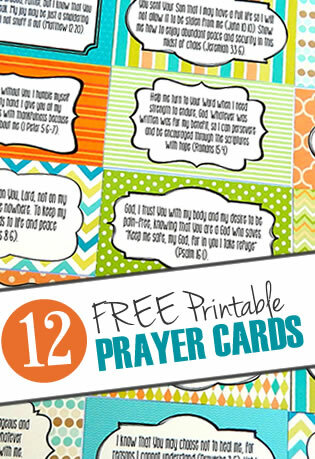 Or make up and 8.5 x 11″ frame and put it on a wall you can easily reach and write quotes or scriptures that encourage you, changing them when you need something new to reflect on! And here is your chance to be bold. Get a thrift store frame and paint it bright red, or pale pink, or whatever color you love but are afraid to use in your decorating. Below is the print I made for my son’s frame. You are welcome to download it and print it out if you want. 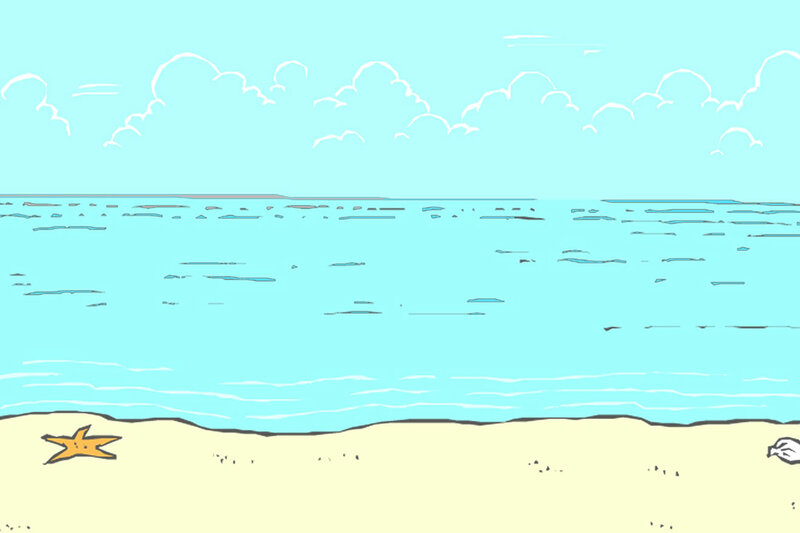 I have made 2: one for a child, and one with just the beach background. PS: On pinterest? You can follow me at http://pinterest.com/lisacopen or our Rest Ministries pinterest account–which is quite cool I must say. I had to smile when I saw this today. I remember we both liked the original idea we saw on Pinterest. I had the same thought about the wording of conditional love. Your changes are great! See you on our pin boards !